Sunday School for all ages is held on Sundays at 9:15 AM. During Lent, we'll be learning more about what it means to be a follower of God. At Maple Grove, we really do believe that everyone belongs - especially children! During Worship at 10:15 AM, a children's "Prayground" area is provided in the worship space so that children have their own area to sit and explore activities related to the sermon during worship. A care room is also available behind the worship space, with a speaker and clear view of worship. On Wednesdays, join the whole church for a soup supper at 5:30 PM, followed by a Bible Study at 6:30 PM. In each age group, we'll be learning more about who Jesus really was and how he calls each of us to follow him. Groups for Adults, Teens (ages 13-17), Children (ages 5-17) and a professionally-staffed nursery for children ages 4 & under. At Maple Grove United Methodist Church every person is valuable. Our youth get the opportunity to become involved. They can start off ringing the call to worship bell, or light the altar candles. When they're ready, our youth get great speaking and leadership experience being the liturgist. What a great opportunity! 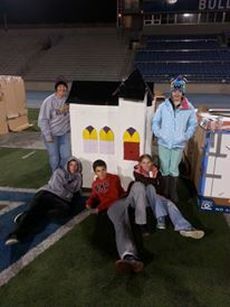 The youth group spent the night in the cold to raise awareness for homeless youth. Each member of the group raised at least $50 dollars to donate to the cause. Youth and leaders made a replica of the church to sleep in. One of the ways we grow as young disciples is through our prayers. Here is a great way for us to remember how to pray for others and ourselves!